Merry Christmas from the Millennial Homemakers! This year, we’re celebrating by bringing you the Twelve Days of Christmas. 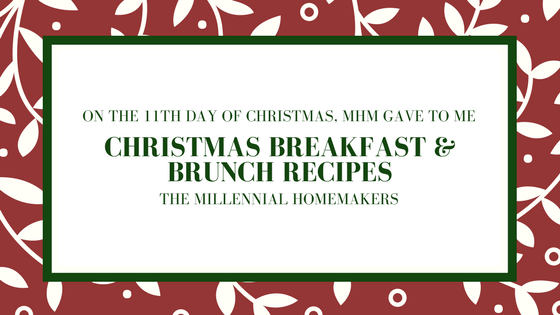 On the eleventh day of Christmas, the Millennial Homemakers give to you - Christmas morning recipes! We’ll share some of our favorite recipes to make Christmas morning for breakfast or brunch. Whisk together eggnog, eggs, nutmeg, and rum extract until well blended. Dip bread into mixture to cover with mixture on both sides. Transfer bread to griddle and cook until golden brown, then flip and cook the other side until golden brown. Arrange crescent roll triangles pointing inward into the shape of a candy cane with edges overlapping. Lightly press triangles together to seal. Beat together cream cheese and sugar. Add egg, beat until smooth. Spoon cream cheese mixture onto the larger part of each triangle. Add cherry pie filling over the top of the cream cheese. Fold tops of the triangles toward the base end of each triangle and lightly press to seal. Bake for 15 minutes, until pastry is golden brown. Prepare your glaze by beating together powdered sugar and milk. Drizzle glaze over candy cane. Grease bundt pan with cooking spray. Place cinnamon and sugar in a gallon size ziplock bag. Cut each cinnamon roll into 6 pieces. Place rolls into bag and shake. Arrange half the cinnamon rolls into bundt pan. Stir together brown sugar, butter, and vanilla. Pour half mixture over rolls in bundt pan. Place the other half of the rolls in bundt pan and pour remaining mixture on top. Drizzle icing over rolls before serving. Cook sausage, bell pepper and onion over medium heat, until sausage is no longer pink. Drain. Mix sausage mixture, hashbrowns, and 1-½ cups of cheese in a 9x13 inch casserole dish. Stir Bisquick mix, milk, pepper, and eggs. Pour over sausage mixture in casserole dish. Bake for 30-35 minutes. Sprinkle remaining ½ cups of cheese. Bake for about 3 minutes longer or until the cheese is melted. Beat together the eggs and milk. Add in biscuit pieces, cheese, onions, and bacon. Pour everything into a 9x13 inch casserole dish and bake for 25-30 minutes.